This works for me too. I switched to avocado oil for the higher smoke point. I make sure I let the cast iron heat up for 20 minuets. The only additional thing I do is press down on the meat or put a cast iron lid from a sauce pan on top of the meat. If you're doing multiple steaks do you clean the CI pan between steaks to keep the butter from burning? Regular butter or clarified/ghee? Yep, really depends how much is left in the pan, if there's enough residue, I'd give it a quick scouring to get it off so the next steak isn't tainted with burnt remnants. Just a dab of regular butter's fine. For my first cook I did a dry aged NY strip, and while I was planing on pan searing, while it was in the bath I was watching some YouTube video and they were using a heat gun and I thought, hmm I have one of those, 2 in fact. It worked great, and honestly after seeing a non-sped up video of using a Searzall in use, I gotta say I don't see where it'd be faster or better than the heat gun I used. There is certainly no fuel taste with a heat gun. The gun I used was 700/1000 degree F gun, which I used on high with a wide defuser. Took maybe 3 or 4 minutes to sear the steak. It is a cheap gun that I bought for a project because I didn't have access to my better one, which for this purpose probably does not get hot enough for searing anyway. Even an industrial 1000 Degree F heat gun is not an expensive thing, costing about what a Searzall, a nozzle and a couple of tanks of fuel cost. Granted it doesn't have that same crazy "Me got flamethrower, me make steaks" aspect to it. On the other side of this, I've not seen one comparison between a torch and a pan sear where the pan sear was judged by anyone as producing a better result. I have not however seen anyone compare a torch to a heat gun, and frankly have only seen an example of anyone using a heat gun at all just a couple of times. All that said, I will probably buy a Searzall and I will probably also buy an industrial heat gun, something better than the cheap one I used, despite working brilliantly well. 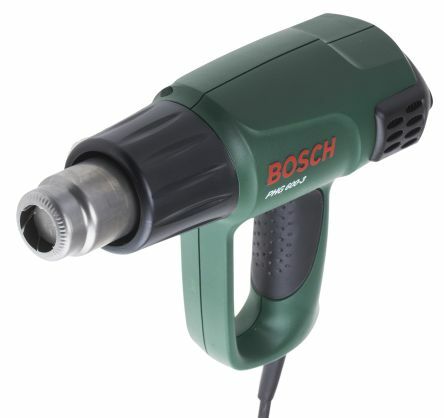 When you're talking of a heat gun you are referring to something like this? I've actually found them useful for dealing with pork crackling. Not really considered using it on steak. Just seems like one more thing to juggle while getting dinner onto plates. This is really my main reason for sticking with a pan on the stove top. It's all there in the middle of everything else going on around it. Yes. very much like that. That is very similar to the one I used. The production line industrial ones look more like some vintage hair dryer. As far as juggling, you have to admit this is less of a juggle than firing up a torch. I just threw a piece of foil on top of a broiler pan on the counter when I did it, cleanup was just throwing away the foil. You haven't seen the tiny kitchen I deal with, hence the reliance of pan and stove top. Flame thrower/torch has always seemed like a bloke-y solution to something, ie) A lot of unnecessary drama and danger. Well yea, it's a very Tim Allen, "hargh, hargh, hargh" thing. But I think that is the point, you know, the whole Cyber Neanderthal, cloud connected cave dweller thing. Not that there isn't some aspect of that using an industrial heat gun mind you, I guess I just look at it from the stand point that maybe the blow torch is just that one step too far that takes it into "wait, hold my beer" territory. There's also the, at least for me anyway, the aspect that while I find butane a rather flavorless fuel, I can't say the same about propane and piped gas (which BTW contains a substantial amount of propane as well). I've always found food cooked on a gas grill to have a bit of a fuel taint to it. Modernist Cuisine recommend propylene (MAP) gas. I've been using this a lot. Most definitely no flavor transfer from that. i defrosted old (about one year old!) rib eyes. used generous amounts of Montreal seasoning and added Italian dressing into my ziploc bag. let it sit about 1/2 hour. set the cooker to 130.5 degrees F...as I like medium rare. the 2 steaks were about 1" thick. let it sit for about 2 hours. in the meantime, i set my oven at 500 degrees....pullled out my cast iron griddle and used peanut oil (as i think it has high smoke point) and heated it in the oven for about 20 mins. i took out my steaks from the ziplocks and patted dry. took the griddle and put on my highest gas burner and seared the steaks 25 second on both sides. 3-5 second all around the edges. my husband said it was the juiciest steak he has had....and he didn't even have to use steak sauce and ketchup!!! and he's a very picky eater! i was very excited. the only thing he said next time is to not make it med rare but more medium. so i will set the temp to 135 degrees F and see if it comes out more to his 'color'. thanks all for your comments and wisdom!!! CC, may i offer a few suggestions for your next family steak cook? First, congratulations on your initial success. You have an excellent grasp of the SV technique already. The 1/2 hour of Italian dressing did nothing for the steaks. You might as well have heated some and poured a little on the steaks just before serving them. Marinate them for a day or two ahead and you will get some flavour penetration and a little more tenderness. I have found that most marinades are a waste of time and product. You can both have your steaks the way you prefer. Next time start with his steak at 135F for an hour, or maybe even a little higher if he likes a true Medium done steak, like 140F. After an hour reduce your Anova's temperature to your preferred 130.5F and add cold water or a handful of ice cubes to get to your new set point. Then add your steak and cook both for a couple of hours. His will stay medium, but a little less juicy inside. Yours will be the just same perfection again. Griddles don't perform too well at very high heats as they release a lot of heat beyond the coverage of the burner. Don't waste precious energy preheating in the oven. Direct heat from a burner is much more effective and won't take more than 15 minutes to achieve ideal searing temperature. For best results be sure the steaks are seared directly over the location of the burner. However, a cast iron skillet will definitely be more effective. ccmurata - To eradicate your smoke problem due to searing inside your house, may I suggest you try clarified butter or ghee instead of oil next time. You will be amazed by both butters very high smoke points as well as the wonderful taste of either one. Both can be easily made within ±15 minutes. PS: I totally agree with Chatnoir. Marinating meat for 30 minutes prior to placing it in a ziplock has no effect whatsoever on the meat (taste or tenderness-wise). Penetration would be nil. Furthermore, mixing Italian dressing with Montréal seasoning destroys the wonderful equilibrium of the seasoning. The best time to add Montréal seasoning is at the table, once your steaks have been seared. Thus everyone can spice their meat as desired. Perhaps one last suggestion would be to get a splash guard for searing inside the house, even if very hot clarified butter or ghee do not splash as much as hot oil. Avocado and rice bran oils are the highest smoke point of readily available cooking oils. But smoke usually comes from burning oil rather than meat. Oil should be used sparingly and applied to an already hot pan. It's dirt cheap here in Australia compared to avocado oil. Apparently it is the other way around in the US.Avocado oil is just as good if it is available and affordable. I haven't checked out rice bran oil, but I picked up my bottle of avocado oil at Costco and it was under $10 US for a 16 ounce bottle if I remember correctly! I live in the US in the Seattle area. Good luck @ccmurata. ccmurata - You're very welcome, bon appétit ! Newbie question here. Can I use the infrared "sizzle zone" grill on our Napoleon gas BBQ to do the final sear on steaks or chicken breasts? If so... any tips please?